Our model number 302C flatwork ironer trucks come in three different sizes: Style 1 accommodates 10 bushels, Style 2 accommodates 12 bushels, and Style 3 accommodates 14 bushels. 5″ All Swivel casters come standard; other caster arrangements available. Liner is an 18 ounce vinyl-laminated nylon, standard color is gray. 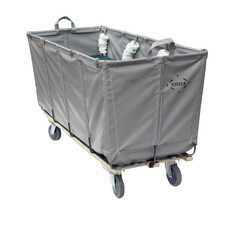 A Spring Platform comes with these trucks and is INCLUDED in price.